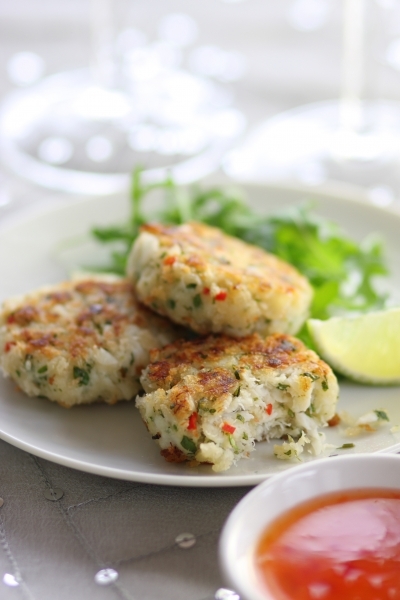 A fun take on crab cakes with an optional hint of chilli heat, great served with a green salad. 1. In a bowl combine all ingredients. Shape the mixture into six equal size patties. 2. Cover the patties with cling film and place in a refrigerator for at least 30 minutes. 3. In a frying pan heat a little oil and shallow fry the crab cakes on a medium heat for two or three minutes on each side until golden. 4. Remove from the pan and drain on kitchen paper. 5. Serve with chilli dipping sauce and a small handful of rocket. To save time crab cakes can be made the day before, covered with cling film and then placed in the refrigerator overnight. Canned crab is a good source of iron, which can stave off fatigue.